The player portrays the skater who must earn the right to compete in the skateparks of the city and ultimately win the title of champion of the skating world. The action starts with the playeri n dhe middle of "Skate City", where all surfaces are skateable – a skateboarder's dream world! 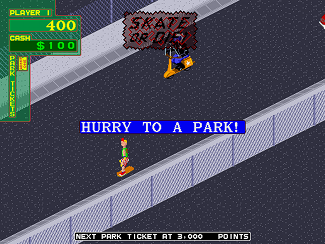 The player earns tickets for performing skullful skate maneuvers in the city. The tickets allow him to enter the skateparks where he competes against the clock for gold, silver or bronze medals. "Cash" prizes are awarded to the skater if he qualifies for a medal. After the skatepark competition, the game continues back in the city for more freestyle action. Numerous hazards and obstacles create a busy scenario in the city, and the skater has a limited time to get to another skatepark. Players can use their "cash" winnings to buy skating equipment from various skate shops located throughout the city. Boards will give the player faster speed. Helmets allow more risk-taking for successful maneuvers. Pads give faster recovery from falls. Shoes provide better height on jumps and quicker starts. Player controls consist of a rotary controller whick allows full circular and directional movement. A kick button keeps the player skating, and a jump button is used to "catch air" for higher points. Anything goes in this game, as players learn to make incredible skate maneuvers. 720° has a new 25″ higher-resolution monitor for better graphics and animation than ever before. Plus, 8″ speakers highlight the custom music, sound effects and speech, making the player feel like he's right there in the action. 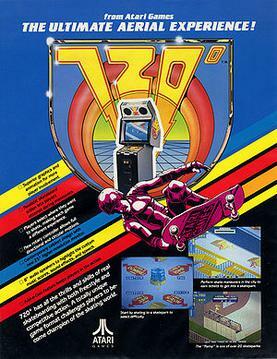 720° is equipped with the comprehensive self-test and statistics package on all recent Atari Games products. Operator difficulty adjustments are also provided by four different option switches.